This weekend seemed to fly by! It felt like the last official weekend of summer (is it really the last day of August!?) so there was a lot going on in Pittsburgh. Luckily, the weather cooperated and it turned out to be a gorgeous weekend! First things first- congratulations to the freekeh giveaway winner Kristen (I'll be sending you an email shortly!). Thank you all so much for entering and for all your amazing lunch ideas! Dan and I went to a Renaissance Fair! Every year, there's an amazing fair near Pittsburgh that I've always wanted to visit. It was a ton of fun! We stopped by a few different shows- my favorites being Cast in Bronze (who appeared on America's Got Talent) and the Duelists (hilarious duo). Every time I think of a Renaissance Fair, I think of this scene in How I Met Your Mother...hilarious! 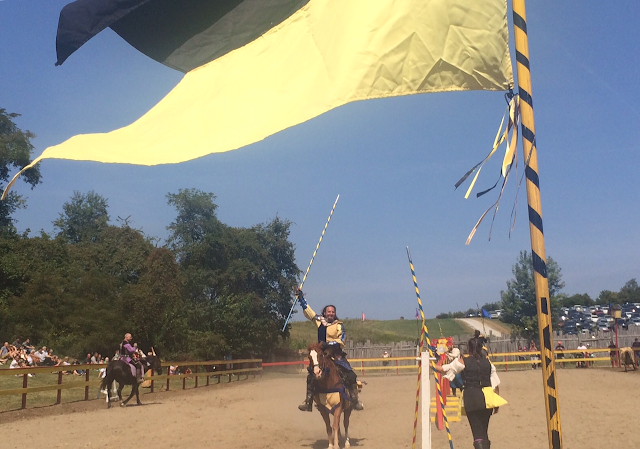 Another highlight was definitely seeing the Jousting! It was so entertaining and we had a great view of the action. The entire place looked amazing! It feels like you're in a small town, with lots of little shops and stages. Most of the people came dressed in costumes, and it definitely felt like we stepped back in time. The fair is open until September 27, and I highly suggest checking it out! Squirrel Hill hosted a night market on Saturday night. There were vendors, food trucks, live musicians and entertainers. It was PACKED! We walked around for a while, but lines were too long at the food trucks and most were selling out of their food. The next market is September 26, and I'll plan on getting there earlier in the evening! For dinner, we stopped at Naya, which serves Middle Eastern food. Dan and I split a platter, which had tabouli, grape leaves, baba ghanouj, hummus, feta, olives served with pita. It was so good! I will definitely be back at the restaurant- the service was great and it was really affordable. I'm going to end this post with a picture of a camel..isn't he cute? 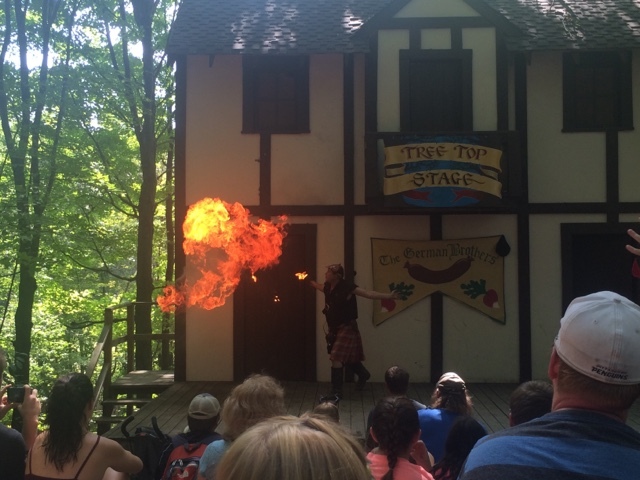 Have you been to a Renaissance Fair? I can't believe it's time for the Renaissance fair again already!! We went with my husband's coworker and his family last year, and my flip flop broke first thing, so I had a very authentic peasant experience walking around barefoot in the mud all day. Ha! I still had fun! Wow that's crazy! I definitely saw a lot of people without shoes so I'm sure you didn't stick out at at all lol! I hope you can make it down. It was so much fun! I remember going to one of those fairs back in my teen travel camp days! Feels like yesterday. I think of the BBT when someone says Renaissance Fair. I went to one in 8th grade and it was pretty fun. Now I could indulge in the adult drinks. Oh, that camel is so cute! I love its smile. My favourite animal is anything cat. Haha that camel is cute. I have plans on the 26 but if they fall through, I must get to the next night out! That sounds fantastic. I have never been to the Renaissance fair but have always heard great things about it! I have never been to a a Renaissance fair before, but it looks cool! That platter of food looks amazing! Hummus is one of my favorite foods ever. It was so much fun! And I love hummus as well :) Delicious! oh yay me! how excitement. this looks super fun - that food looks soooooo good. i love mediterranean food. My favorite animal = Fox. And I love dogs. That Med platter looks delicious!!! Yum. And that camel looks like it's smiling!!! I was thinking about getting my hair braided but ended up passing. Now I wish I did it! I wish I got to ride on an elephant..that sounds really fun! I used to go to a Renaissance fair when I lived in Florida and loved it. Looks like a great time. I'm sure they'll be back next year! They're fun but it was super crowded so you might not like it. It's nothing different than the arts fest but on a smaller scale! I loved following along with your Snapchat of the Ren Fest this weekend! Those are so fun! Okay, actually I haven't been to one but I did go to a joust tournament and Medieval times once so that's kind of similar, right? LOL. SO cool that you went to a night market. I'd love to go!